Originally published under the title, "New Saudi King Displays Candor on Radical Islam." King Salman's attack on "Islamized terrorism" is less euphemistic than President Obama's war on "violent extremism." Following the death of Saudi King Abdullah at the end of January, and the succession of his half-brother, now King Salman, 79, many observers of the desert monarchy have speculated on its future. Almost immediately, King Salman has commenced an effort to clear the air regarding Islamist ideology and its association with terrorism. That's rather unlike President Obama. While he and some other Western leaders claim they are combating radical Islam, they habitually refuse to call it by its correct name. Instead, they employ euphemisms. On February 18, Obama summoned a three-day conclave titled "Countering Violent Extremism." Such terminology suggests that the atrocities of the Islamic State or ISIS, al Qaeda, the Taliban and other South Asian jihadists, and Iranian operatives in various countries, are mere aspects of a general planetary wave of ethnic and political turmoil. They are not. Radical Islamist terrorism reflects a feature of Islam that has erupted and then subsided repeatedly over the centuries of Muslim history. It has its own specific content and dynamics. But the merest recognition of this reality was absent from a fact sheet on the "White House Summit on Countering Violent Extremism" issued by the presidential press office. In nearly 1,700 words of bureaucratic boilerplate, references to "Muslims," "Islam," "Wahhabism," "Taliban," or "Iran," did not appear even once. Obama sees Islamist terror as a sociological conundrum, involving "underlying grievances and conflicts that feed extremism." Instead, the fact sheet was replete with the suffocating esoterism of the Beltway vocabulary, referring to "drivers and indicators of radicalization," "stakeholders and practitioners," and "extremist messaging and narratives." Nothing that transpired at the "summit" indicated any better reasoning in the current administration. Indeed, according to a February 13 report entitled, grotesquely, "Obama Summit Targets American Extremism," on Voice of America News, the meeting was concentrated as much on social pathologies like urban gangs in our country as on Islamist fanaticism. "Countering Violent Extremism" was provided with its own acronym – "CVE" – which will probably be forgotten quickly, just as the approach itself is likely to fail. Before September 11, 2001, Islamist terror was treated as a criminal problem. Now it is viewed by Western elites as a sociological conundrum, involving, as stated by Obama in his address to the United Nations in September 2014, "underlying grievances and conflicts that feed extremism." While obstacles to Muslim integration in some Western countries, and youthful alienation, feed radical recruitment, little progress has been made, in 13 years since 9/11, to broaden Western comprehension of the more basic role of Islamist ideology. In this context, the responsibility of Iran for encouragement of the hideous bloodbath by the Syrian regime should not be overlooked. 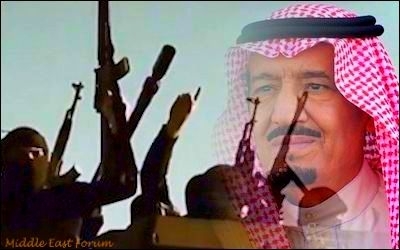 The anti-terror strategy adopted by King Salman appears predicated on impressive clarity and frankness. Saudi King Salman, by contrast, has put forward a very different attitude in remarks to a conference of Islamic scholars in Mecca in February, under the rubric of "Islam and Counter Terrorism." As reported by the Jidda-based Saudi Gazette, "the King said the entire world is threatened by the 'Islamized terrorism' which kills, destroys and commits all kinds of vices under the name of Islam." In addition, "he said the detestable crimes of terrorists were the root cause of the hostile campaigns against Islam and Muslims," according to the paper. King Salman added that many people fear Islam and "are skeptical of us and our religion." Aside from Saudi Arabia, the Mecca conference drew participants from Lebanon, Sudan, Egypt, Algeria, Morocco, Senegal, India, France, Thailand, and other countries. The meeting was held by the Muslim World League (MWL), created in 1962 as a trans-national coalition of Wahhabi and other fundamentalist entities. MWL came under widespread suspicion in the aftermath of September 11, 2001. MWL currently has offices in 34 Muslim and non-Muslim lands, and operates 21 expansive mosques or "Islamic cultural centers" on six continents. But MWL has not returned to the area of Washington, DC, where its office in Herndon, Virginia, was raided by U.S. authorities in 2002. Its past establishment of grandiose mosques and distribution of cash across the globe were, it seems, curtailed under King Abdullah, whose reign began in 2005. MWL has not, however, increased the sophistication of its image. Its website is poorly edited and confuses, currently, South Korea, where MWL operates a mosque and office, with North Korea. These juveniles and fool dreamers… [w]ith their reckless actions and careless audacity to spill innocent people's blood… have horrified honest people and terrorized Muslims and others… they shout 'there is no god but Allah,' and 'Allah is great.' To these zealots, these are empty slogans without any substance… this distorted campaign has committed horrible sins under the cover of Islam... The time has come for scholars, preachers and people of conscience to warn people against this scourge, and disavow it. In its final communiqué, the conference condemned "the ideological deviation ... based on irrational concepts that govern the Muslims' relationship with others. These include jihad." The summary document stated that terrorism "has tarnished the image of Islam throughout the world," with "an unfounded wave of accusing people of apostasy, depravity and [unacceptable theological] innovation… atrocities have been committed [based on] erroneous and unfounded interpretations… the stigma of terrorism [is] attached to [Muslims]. sectarian strife, and mounting animosity among Muslims, have drawn them into conflicts, and driven them into warring factions. Their communities and their countries are on the verge of crumbling into small factional and ethnic feuding entities; distracted away from working for the best interests of their nation and civilization by these conflicts. Muslim minorities have been denuded of their potential. A wedge of enmity has been driven between them and their fellow citizens and communities. The relationship soured among compatriots of one single country, and has spoiled any chance of rapprochement... Thus, Muslims faced isolation and marginalization in their own homelands. The idiom of the Mecca conference represents a difference from past rhetoric by Muslim leaders aimed only at dissociating radical Islam from the religion as a whole, or blaming the West for the problems within the faith. Much more is required to make a new commitment to self-examination among Muslims real. But as his predecessor, King Abdullah, adopted small but meaningful internal reforms, King Salman has begun a significant, more ambitious process, and we may hope he has the courage and stamina to carry it through.